i’m so excited! 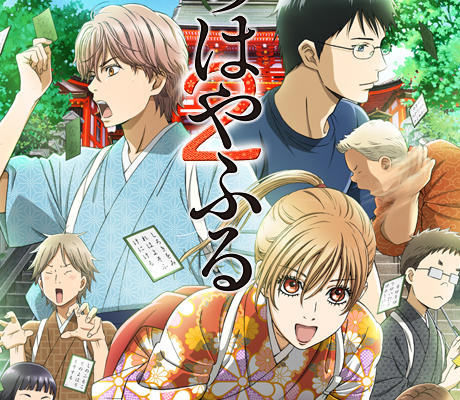 chihayafuru just came back and judging by the first season, the anime will just get better and better. for those of you who didn’t watch the first season, i suggest that you watch it as soon as possible. it’s funny, the art is gorgeous, and all the characters are absolutely amazing. it’s about chihaya ayase who loves karuta which is a card game in japan (just google karuta, it’s hard to explain…) that is also extremely competitive. when chihaya was younger, she met a boy named arata wataya who basically taught her how amazing karuta really was. ever since then, she’s been striving to be the best karuta player in japan and now she’s in high school and of course she starts a club and meets incredible people while playing karuta. so far in season 2, it’s been great. it’s still hilarious, the art is still as good, and things seem like they’ll get better so definitely watch this anime! it’s about a 23 year old office lady named Komatsu Momo who was separated from her three brothers fifteen years ago. now she’s planning to get married soon and so she contacts her brothers and soon everything gets turned upside down. it’s by Enjouji Maki so the art is good, there’s a lot of humor, and you’ll grow to love all the characters! josei readers will love this! it’s about two cats in a cat society. mikumo is this adorable and reckless cat who is rescued from a car accident by yashio who is a debt collector and he basically makes sure that when a cat loses one of its nine lives, their name gets changed (you’ll get it once you read it….). eventually mikumo starts to work together and the one of the most adorable cat/debt collector duos is formed.